There are many people in this world who are like lamp. There is oil, there is wick but they can not burn to himself uninterruptedly. Sometimes it is necessary to incite the fire with a stick. The lamp is again lively. Professor Nut-Boltu-Chakra is the that type of male who born on huge talent. But like a dependent child in nature. Famous artist Pablo Picasso when learning to speak, then he just shouted 'pencil pencil'. With the help of pencil he became world-famous in his life. If you look for it, you may know that during the childhood, Professor Nut-Boltu screamed - 'Lab-Lab'. Why not, he is world-famous today for his laboratory. At least for children. The main topics of this book are about his scientific activities. 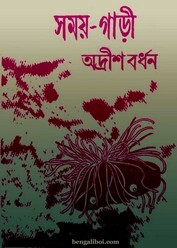 Now I want to share an excellent sci-fi book- 'Samay-Gari by Adrish Bardhan'.